When the crew of Apollo 8 removed their suits as they headed Moonward, they did not put them back on for the rest of the mission, as there were no plans for a spacewalk or any undocking event that risked the integrity of the cabin pressure. After the flight, Frank Borman wondered whether they had been required at all. "I would not have hesitated to launch on Apollo 8 without pressure suits,'' he said at the debriefing after the mission. He continued, "We wore them for about 3 hours and stowed them for 141 hours. I see no reason to include the pressure suits on a spacecraft that's been through an altitude chamber.'' However, suits were needed for the ascent to allow the crew to breathe pure oxygen, and for the whole flight in case the spacecraft's hull was breached for some reason. All subsequent flights did require the crews to suit up regularly, either for operational reasons (going outside being the obvious occasion) or as a precaution when pyrotechnic charges were cutting pieces from the spacecraft. 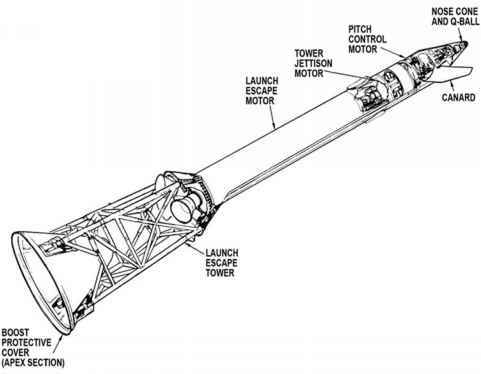 For example, the final jettison of the lunar module meant having an explosive cord cut through the tunnel right beside the forward hatch. Bill Anders's space suit. Hardly worn, it is on display at the Science Museum, London. 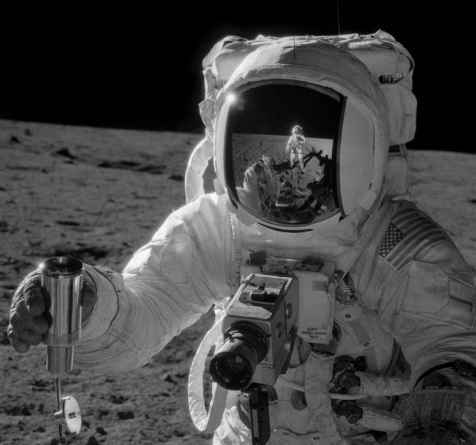 Alan Bean holds a sample container. His gold visor reflects Pete Conrad who is taking the picture. produced for Apollo. The CMP had a simpler suit while the surface crews' suits were designed to support a back pack that allowed them to work on the lunar surface. The following refers to the surface suit. Air to breathe was fed into the suit either from the back pack, called the portable life support system (PLSS, pronounced 'pliss'), or from the spacecraft via hoses. A fine network of water-filled tubes worn next to the skin kept control of the suit's internal temperature as the crewman worked. The main part of the suit had an airtight bladder with layers of Dacron fibre, Mylar foil and woven Teflon cloth to protect against heat and cold. The outermost of the suit's 18 layers was white Teflon cloth that helped to protect against abrasion. Instead of sunglasses or goggles, a polycarbonate helmet was worn over the head that allowed almost all-round vision. An additional cover, which was worn over the helmet, included various visors, including one that was thinly plated with gold to reflect light and infra-red radiation. It also had a set of pull-down shades at the top and to each side that the crewman could deploy to protect his eyes from the intense lunar sunlight. When inflated to a pressure of 250 millibars, the suits ballooned and stiffened, making them difficult to bend and hold in a set position. To counter this, flexible joints were built into various parts of the suit and a network of cables within the layers allowed a posture to be adopted and held. The gloves contained thermal insulation and the fingertips were made from silicone rubber to help to improve the astronaut's sense of touch. On Apollo 15, Dave Scott arranged to have his fingertips up against the end of his gloves with the result that, over the course of his 18 hours on the surface, his fingernails were bruised and had begun to lift from his fingers. The PLSS carried batteries for powering the pumps and communications gear, high-pressure oxygen for breathing, a lithium hydroxide canister for removing carbon dioxide from the suit's air, and a supply of water for cooling. The cooling element was a clever piece of kit called a sublimator. Water was fed through a porous metal plate where, on reaching a vacuum, it evaporated, thereby removing heat to form ice. From that point on, the ice sublimated to space, taking heat with it as long as more water was fed to replace the lost ice. This cooled the separate water circuit that went around the crewman's skin. 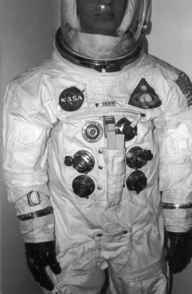 By the end of Apollo, a crewman's suit was a heavily abused item of clothing that had undergone 20 hours of intense work in the hostile environment of the Moon. Often a crewman would accidentally fall over, covering himself in dirt, or the mudguards over the wheels of the rover would break off and the crew would be sprayed with dust as they drove. The suit's outer layer was therefore heavily ingrained with dirt and its locking rings around the neck and wrists threatened to seize up because of the highly abrasive nature of the all-pervasive lunar dust. These multimillion-dollar wonders of engineering are now museum fodder.